"The knee is the dumbest Joint in the body"
So says Gary Gray of the Gray Institute. Tough words for your loyal friend and ally on this journey through life! The element of truth here though is that the forces acting on the knee are largely controlled by the foot below and the hip above. It’s counter-intuitive for sure but If you have knee pain its most likely not the knee’s fault! So although the knee may not be the smartest cookie in the jar, it is most likely the victim in this instance and not the criminal. Medically referred to as genu valgus and colloquially referred to as knock knees, this posture goes by many names that all indicate a shift of the knee towards the midline. In the world of Anatomy Trains where I received my Structural Integration training we call it "X" legs because, well, it looks like an X. This is a heavily studied pattern with tons of research investigating the particulars so know that with some creative searching you can quickly go down the information hole. In this post however we are looking to keep it simple. We will look simply at how to recognize it, what the most likely causes are, what the potential impact is to your body and most importantly what to do about it from a postural perspective. Some level of knee valgus is normal during gait and running. This indicates that it is not something to be avoided entirely but is something to be controlled. Some level of knee valgus is also normal during early childhood. It tends to correct naturally as we grow. The knee is most likely not the responsible structure and most often is compensating for hip / ankle / foot dysfunction. As with all postural patterns they don’t develop overnight! it took you a long time to develop the pattern and it will most likely take a long time to reverse. Respect the process. Your awareness of the pattern and daily habits are the most powerful tools you have in correcting any pattern. So what is normal positioning of the knee and do I have it!? I hesitate to call anything normal or abnormal in human movement as we all really are fairly unique snowflakes. 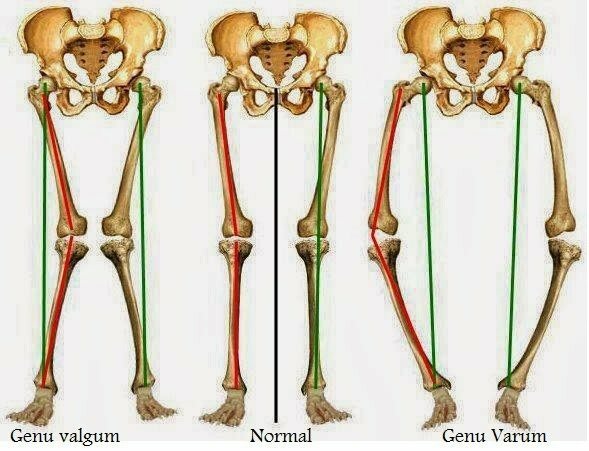 I see functional varus / valgus relationships at the knee with clients of all ages and abilities. That being said the literature available makes it pretty clear that ACL injuries and Patello-femoral pain are strongly correlated with an increased valgus position of the knee. We want to be able to go into this position but the real question is...can you control it?! How do my knees track in function? A quick functional test is to simply sit down into a chair and stand back up. Did you see which way your knees tracked with respect to your toes? Both knees would ideally track over the second toe. If you notice one or both knees tending towards the midline and tracking over the big toe or even to the inside of the big toe, then once again we have some room to promote ease and efficiency at the joint. Don't get super critical with this one. Some level of knee deviation is perfectly normal especially during functional activities like walking and running where it follows the pronation of the foot. The trick is to be able to control the movements of the knee and to have options for movement. Why are my knees shifting into an “X” pattern? As stated before the knee is mostly forced to do the bidding of the hip joint above and the ankle joint below. It has very little decision making ability in human movement. With respect to the hip the common culprits tend to be an Inhibited Glute Complex coupled with Overactive Adductors and Internal Rotators. With respect to the ankle the criminals tend to be Inhibited Dorsiflexors and Inverters coupled with Overactive Plantarflexors, Everters and Tibial External Rotators. It’s not always this simple but for most folks releasing what is overactive, strengthening what is underactive and generally being aware of basic posture in sitting and standing is enough to get things moving in the right direction. Why does it matter if I have “X” legs? What are the Lines of tension and compression at the knee? If we focus our attention at the knee can you see that the medial aspect of the knee is experiencing increased tension? The tissues of the Medial Collateral Ligament, Pes Anserinus and Medial Joint Capsule of the knee are all excessively tensioned. Conversely can you see that the lateral aspect of the knee is experiencing increased compression? The articular cartilage and meniscus of the lateral knee will experience increased compression and increase the potential for arthritic degeneration. The patella will also experience stress as it will track incorrectly within the trochlear groove predisposing it to artificial wear and arthritic changes. Over time this imbalance in compression / tension forces will damage an otherwise healthy knee. It isn’t a question of if but when. What are the lines of tension at the hip? This same scenario plays out at the hip. Can you see a decreased angle between the femur and the pelvis where the adductors have pulled short? Can you then see the increased angle on the outside of the hip where the abductors are pulled taught? We can then start to play these relationships out along the myofascial continuities asking...What is happening at the Sacroiliac joint further up the chain? What is happening at the arches of the foot further down the chain? So what The hell do I do about it!? Is my "Tripod" evenly balanced? If you imagine your heel, the ball of the big toe and ball of the little toe as three points of a triangle...is your weight balanced fairly equally among the three points? If you notice a propensity towards the inside (medial arch), outside (lateral arch) of your foot or towards the balls or heels of your foot then there is great opportunity to redistribute your weight and have a more even “tripod”. Then the question becomes…Are you evenly balanced between both feet? If you happen to have two identical scales handy then you could stand with one foot on either and see if they read the same. You may be surprised at the result! Scales are not necessary for this however as you will most likely have a fairly intuitive sense of which foot is receiving more weight. Practice this awareness of the tripod and the balance between the feet everyday. Opportunities abound as you stand in lines, brush your teeth, make coffee in the morning, stand at your standing desk...take all the opportunities and over time it will become automatic. How you stand and sit matters...and so does your footwear! A stance common to folks exhibiting an “X” leg pattern is to drop one side of their pelvis into a lateral pelvic tilt. This places more weight over one leg and alters the muscle balance of the hip abductors and hip adductors on the inside and outside of the hip. A quick check for this is to feel for your ASIS (the bony prominence on the front of your pelvis) on both sides of your hip and see if one side is higher than the other. Try to redistribute your weight evenly over the tripod of your feet and between both legs. In sitting anytime you have your knees coming together before your feet whether it be to support a laptop or in the classic “W” position common to children...there is the potential for patterns to take shape in the body. Is your heel significantly lifted over your toes while wearing shoes? This isn’t a problem reserved for those wearing high heels. Almost all shoes whether boot or sneaker have a significant amount of lift in the heel. We sacrifice much for fashion but be aware that this causes an abnormal shortening of the posterior musculature of the lower leg and can be a significant contributor to all manner of orthopedic ill.
What is my movement variability? This is a much deeper question than simply sitting vs standing at work. How many ways are there to sit? To stand? Are you switching between them? No posture is bad posture! The only bad posture is the one you continuously assume and maintain. There are endless ways to sit and stand...use them all! Are you switching between different footwear? Do you spend time barefoot? Do you get the opportunity to walk barefoot on different surfaces? Variety is the key to unlocking the inherent potential of your body for change. Our forms are plastic and responsive. Yes they adapt quicker in youth but to use your age as an excuse is quite simply a cop out. You have the ability to adapt physically, mentally and emotionally until the day you die. Get it together and add variety to your life. Get out of a chair and sit on the floor or sit on a physio ball. Take off your shoes and walk in the grass. Stand in a lunge or on one leg. You get the idea. Just make it different and keep moving!